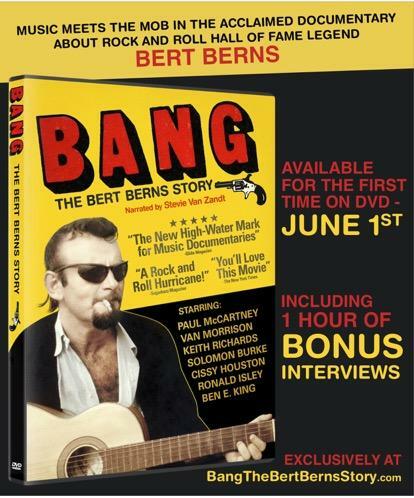 HOLLYWOOD (Perfect Music Today) 5/8/18/–Virtually since its debut at the 2016 SXSW Film Festival, demand for a DVD version of BANG! The Bert Berns Story has been mounting. In the intervening time, the feature documentary has been screened at more than 50 international film festivals, theatrically released in numerous major markets and digitally released thereafter. Along the way, it attained a 100% Fresh rating from Rotten Tomatoes and earned five (out of five) stars from MOJO. Now, the film’s producers have announced that, at long last, a DVD release is set for this June 1. The BANG! DVD include a full hour of additional footage, including interviews with Paul McCartney, Keith Richards, Ronald Isley, Cissy Houston, Andrew Loog Oldham, Solomon Burke, Betty Harris, Mike Stoller, Ben E. King, Doug Morris, Joel Dorn and Carmine “Wassel” DeNoia, among others.